Social Mobility and Inclusion – Can architectural and urban interventions help improve it? Poverty and exclusion are two of the major issues that politicians – but more importantly in the context of this blog, architects, planners, and urban designers (or students of such professions) often refer to when they present projects of “improvement” or of spatial articulation between informal settlements and the formal city. Often, their final objective is to generate positive inclusion social mobility – that is, the movement of individuals or groups up (or down) from their current socio-economic level. And so, the question is: can architecture or design truly improve social mobility? Janice Perlman, one of the few researchers that has continuously investigated life in favelas for more than forty years, published her latest book “Favela: Four decades of Living in the Edge in Rio de Janeiro” in 2010. [i] Last week, I had the opportunity to attend her presentation at the Inter-American Development Bank in Washington, DC, and I think it is critical for anybody interested in urban informality to look at her findings in detail. I am aware that among my colleagues, her findings are well known, but given that this is an open blog and that there is a worldwide increase in interest on this topic, I want to present a few of her findings here. My intention is simple: too often do I find myself in reviews or project presentations where the preconceptions of designers undervalue the reality and dynamism found in informal communities, rendering many of their efforts naïve and ineffective (and I include some of my own efforts here). In this post, and with the intention of generating further discussion and analysis, I want to address two ideas that many times seemed preconceived. Education is a top priority – thus we always need more schools and libraries in informal settlements. 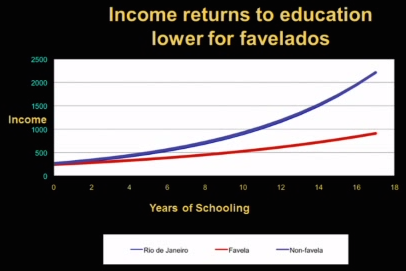 Based on a study made by Valeria Pero, and cited in Perlman’s book, the relationship between income return and education widens for every year of education between favela and non-favela residents (see Graphic 1). In other words, if you compare the income of a person that lives in an informal settlement, to a person that does not, even if both have the same years of education, those living in marginal neighborhoods are paid less. Although this phenomenon can be a reflection of educational quality – as some suggest that teachers in informal settlements are not as well prepared, favela residents suffer from strong discrimination in the job market because of their employer’s stigmatized views. “In light of this, it is no wonder that favela residents have become disillusioned with education”, Perlman writes. Further interviews with residents show that education is now only the second priority after having a job. 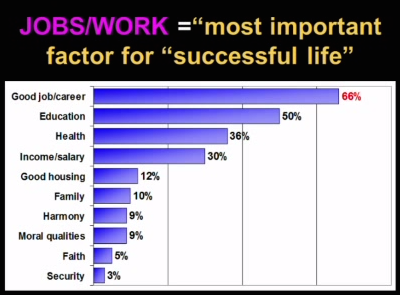 For the persons interviewed, finding work is even more important than health, housing and family (See Graphic 2). It is important to make clear that this does not imply that education in informal communities is not important – it is just not an immediate priority for many residents and thus an issue to be addressed through other programmatic elements in planned interventions. Another interesting finding by Perlman is that there are factors that increase or decrease the likelihood of a person to leave the favela. Three factors that increase these chances were: 1) the person had more educated parents, 2) the person was him or herself more educated, and 3) the person had more knowledge about politics (in this case Brazilian politics). On the other hand, 3 factors that decreased the probability of leaving the community were: 1) the person owned his/her home within the neighborhood, 2) the person had a formal job – usually close to the favela, and 3) the person belonged to a community organization within its social group. The clear relationship between education and departure from the favela is in itself a point to consider. On one hand, it seems as like the opportunity to know more augments the desire to belong to “the other” group and thus leave. On the other hand, the group that often decides to stay does so not because of lack of economic capacity – or even education, but by choice. Better housing and urban services insures inclusion, dignity, respect and equal treatment for informal settlement’s residents. Perlman’s research includes interviews with more than 2,182 persons over the course of four decades. Starting in 1968, the author gathered information regarding improvements on living standards, where she found positive development and substantial upgrades in building materials of houses, access to urban services, household good ownership, education and jobs (Graphic 3 and 4). This change can be attributed to two factors: the self-improvement attitude that characterizes favela residents and the efforts of development agencies that together with national and international governments have almost solely focused on improving housing conditions, on-site upgrading and land tenure. But does getting better housing and urban services meant that residents’ social inclusion was also improving? When asked about the types of discrimination that they suffered, community members mentioned that “living in a favela” was the most common one – more than skin color, appearance and birthplace (Graphic 5). In fact, between 1968 and 2003 the perception of this type of discrimination grew among dwellers. What does this mean? It simply means that even though a lot of effort has been put into the improvement of the constructed landscape, little has been achieved in terms of the psychological and economical environments in which residents of informal settlements dwell. It has been suggested by various authors that the “periphery is now at the center” and that the renewed interest in urban spaces of social marginality and inequality could become a sign of a desired collective articulation. In fact, many argue that cities like Rio and Medellin are at the forefront of such intent. But is the periphery really at the center if we are still looking at it with a “centered” vision? Grassroots movements, participatory processes and well-intentioned small-scaled projects are all positive intents, but are we – architects and designers, really doing something to change both sides of the equation? Can we? I am not entirely sure of the answer, but as other writers in this blog have pointed out, I think there are two things we need to be constantly thoughtful of. 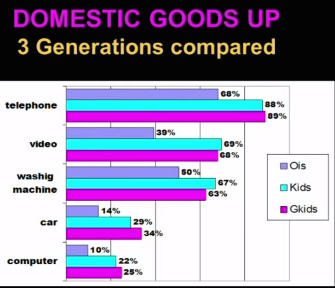 On one side, we need to be very careful and avoid falling into the “glorification” of informality. As Daniela Fabricius wrote in her counterpoint argument in Looking Beyond Informality: “in this acceptance of informality, it is all too easy to forget that to live informally is to live precariously.”[ii] And secondly, we need to be constantly reminded that more often than not, we are “outsiders” to the problem of informality and thus need to look at it from a holistic point of view, not forgetting that maybe the answer to the problems of informality are not buildings of urban interventions but actually a radical change in our professional and social model’s point of view. [i] Perlman, Janice E. 2010. Favela: four decades of living on the edge in Rio de Janeiro. Oxford: Oxford University Press. [ii] Del Real, P. 2011. Simultaneous Territories: Unveiling the Geographies of Latin American Cities in Leguía, M., Ed. Architectural Design Vol 81 N 3. London, UK, Wiley, p. 17. Reblogged this on reflections on the everyday. I am not an architect or a designer. I’m an urban economist (a mixed and twisted research subject), but I perceive that regardless everything else, the quality of built environment at the building scale makes a difference. It is true that spatial segregation goes beyond education achievement, and it is also true that unemployment is a serious concern. But those problems are casued by larger macroeconomic and historical determinants of the Latin American societies that cannot be changed at the building or even at the city scale. 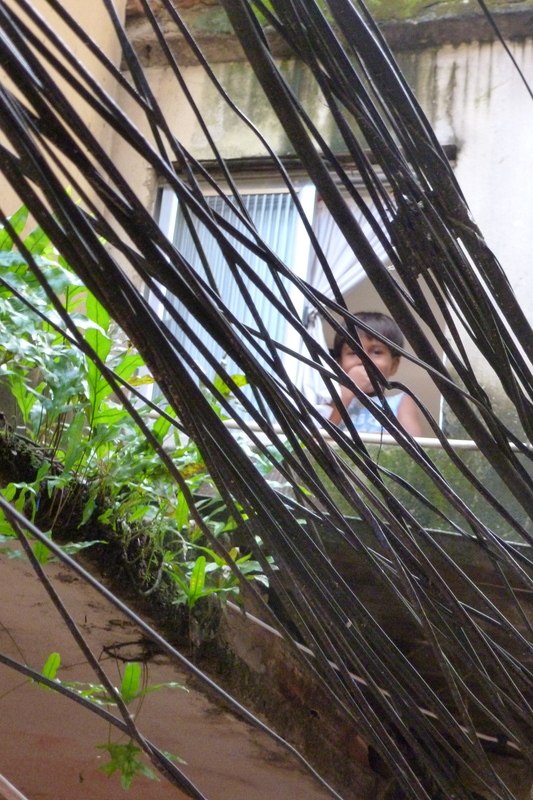 In that order of ideas, mitigation is the best we can do at the local scale, and that is where architecture and design can make a difference, not only for favela dwellers, but for all the Latin American urban dwellers. Great to hear from you again! And thanks for the comment – I agree with you, and I believe urban-economy is a critical profession today. For instance, I think that mapping economical inequality and economic processes (many of will show the link between formal and informal economies) is critical for our understanding of such problematic at different scales. I am by no means suggesting that interventions in the built environment have no impact, I am questioning the depth of such interventions in relationship to their conceptualization, design, construction and maintenance processes. If not addressed holistically – and I see this a lot, there could be a series of unintended economical, social, cultural and political consequences that might bring down the good intentions of the designers. Thanks for the comments – and I would like to keep the conversation going. Can you share your experiences as an urban-economist in terms of how form and architecture can improve social mobility? I am curious as to how Perlman’s findings relate to other experiences. For example: do you think that architectural interventions in informal settlements change the way “others” perceive residents in such communities? It is more difficult to detect the positive effect of high quality (higher than what expected for the corresponding urban section) architecture on the wider urban economy. But the negative effect of bad design solutions is more evident, when checking the negative effect on land prices in the surroundings of skyscrapers, where long empty walls or arid urban landscapes are the ideal environment for criminal activities that devaluate real estate properties. Those phenomena can be detected as ‘discontinuities’ of the land price functions.